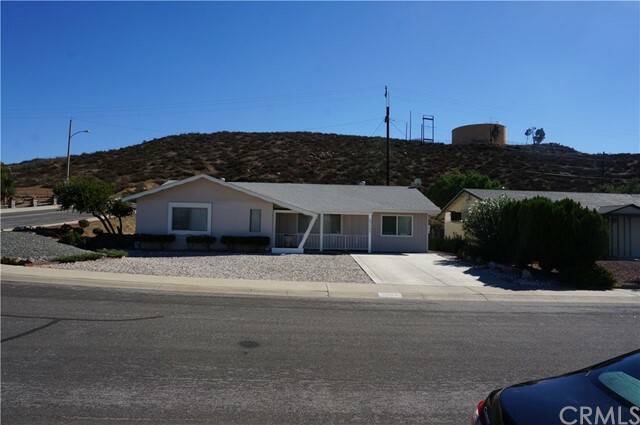 All Sun City homes currently listed for sale in Sun City as of 04/19/2019 are shown below. You can change the search criteria at any time by pressing the 'Change Search' button below. "PRICE REDUCED!!!! !COME SEE THIS HOME TODAY! Pride of Home Ownership. This home has a wonderful open concept. The kitchen boasts beautiful granite counter tops and backsplash and a beautiful brand new oven hood. This is wonderfully set up for entertaining. The master bedroom and bathroom are a nice size. The inside of the house has new paint and carpet. There is also a large room that could easily be made into a 5th bedroom if the new owner so desires. The back has a large patio with artificial turf. Has some wonderful vegetation and is well maintained. 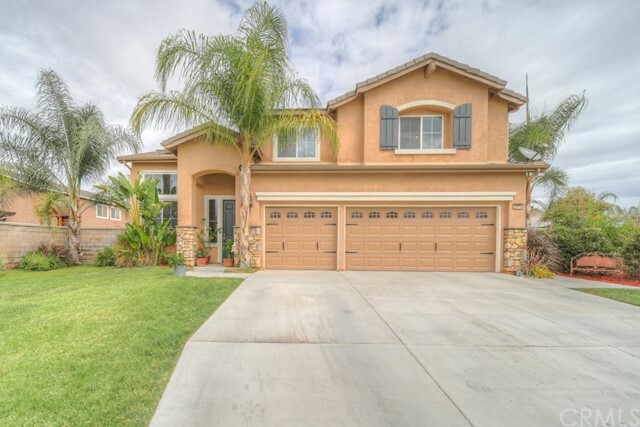 This large home sits in a quiet cul de sac. The house has been well taken care of and ready to move-in. The Hero loan will be paid off with solid offer. Don't pass this one up." "This beautiful home has 4 bedrooms and 3 full bathrooms. The entry to this home is adorned with a tile medallion that highlights entryway. This amazing Kitchen is an open concept to the Family Room for lots of entertainment. One bedroom is located on the main floor. Upstairs is spaciously laid out with an extra-large loft with an adjacent large Master Bedroom. Ceiling fans with remotes throughout the house. 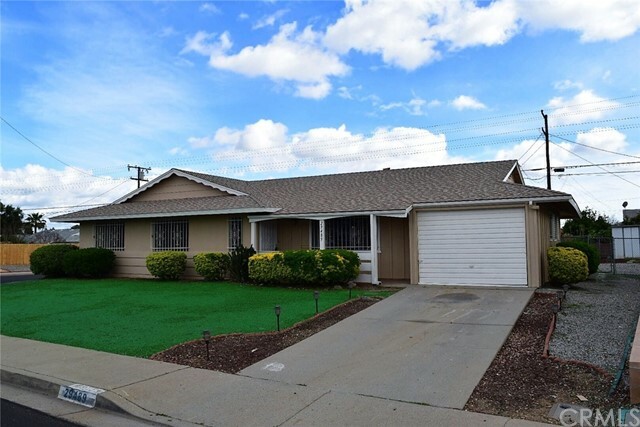 This home is centrally located near the new shopping centers and has easy access to the freeways. Neighborhoods: Sun City Equipment: Range/Oven Other Fees: 0 Sewer: Public Sewer Topography: LL"
"Spacious Pool Home. No monthly HOA fees! 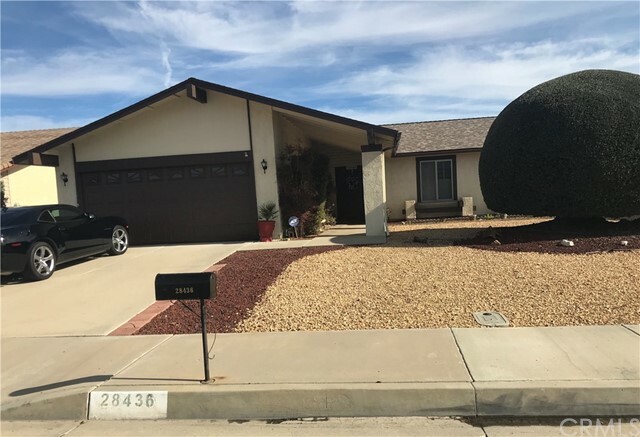 This lovely family home has so much to offer and is located in the beautiful city of Menifee at the end of a very quiet cul-de-sac. The lot size alone which is flat and usable is approx. 13,068 sqft. The home boasts approx. 1,954 sqft. with 2 oversize, spacious bedrooms, 1 additional room (can be used as a Bedroom/Office) and 2 full baths. 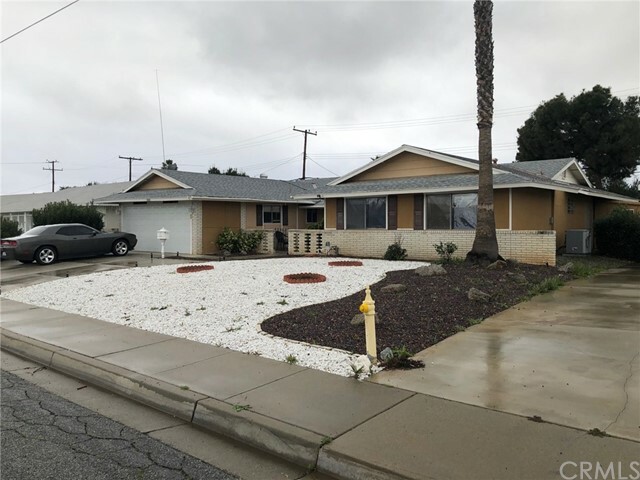 Both full baths are gorgeous and remodeled The master suite has a sitting room attached which could be converted into an additional bedroom, it also has a custom walk-in shower with separate tub. Tile and carpeted flooring Custom painted. Reliable Air conditioning unit. Cool ceiling fans. Some crown molding. Walk in closet. Can lights and Dual Pane windows. The home also has an enlarged kitchen with stainless steel appliances, tiled Kitchen Island and Convenient indoor laundry. French doors leading out to the Enclosed Sun Room and stunning In Ground Swimming Pool and Spa. With a Natural gas BBQ Island with Refrigerator and perfect for entertaining large groups. Full alumawood patio cover. Handy shed remains. Landscaped both front and back yards with sprinklers and timer. And the home owners have plenty of gardening supplies which will remain for the buyers with a Green Thumb. Front of home is so welcoming with a nice veranda porch. Spacious 3 car garage with epoxied floors. Rain gutters. Lower taxes. Close to schools, freeways, hospitals and shopping. A true must see!!" "**HOT BUY**HOT BUY**HOT BUY*** 5 BEDROOMS 2 BATHROOMS ***NEW INTERIOR AND EXTERIOR PAINT**NEW CARPET****NEW BASEBOARDS** BEAUTIFUL FIREPLACE IN THE FAMILY ROOM**NEW LANDSCAPING FRONT AND BACK**THIS IS NICE CLEAN HOME THAT IS MOVE IN READY**CLOSE TO ALL SHOPPING, RESTAURANTS AND SCHOOLS**NICE ROCK KOI POND IN BACKYARD... 24HR RESPONSE ON ALL OFFERS...."
"Price Reduced!! Wonderful Single Story Home, Move-in Ready, Featuring 3 Bedrooms, 2 Baths, 2-Car Finished Garage and RV Parking. Kitchen with Ample Cupboard Space Open to Eating Nook, Family Room with Gas or Wood Fireplace. Ceiling Fans Throughout. Generous Size Master Bedroom, Master Bath With Walk-in Shower and Double Closets. Good Size Bedrooms and Second Bath Includes a Relaxing and Large Soaking Tub. Nice Flowing Floor Plan with Crown Moulding, Travertine Floors and New Carpet. Slider Opens to Backyard featuring a Covered Patio Great for Entertaining and Other Endless Possibilities. All Appliances in the Home are Included. New A/C, Furnace and Water Heater. New Sod in Front and Back Yards. Private Backyard with Gorgeous Masonary Planters and Block Wall. Beautiful Park Across the Street. A Rare Neighborhood with No HOA, No Mello Roos. Will Not Last, Preview it Today!" "This Sun City two-story offers a fireplace, master bathroom sitting vanity, second living area, nearby park, and a two-car garage." "Priced to sell. 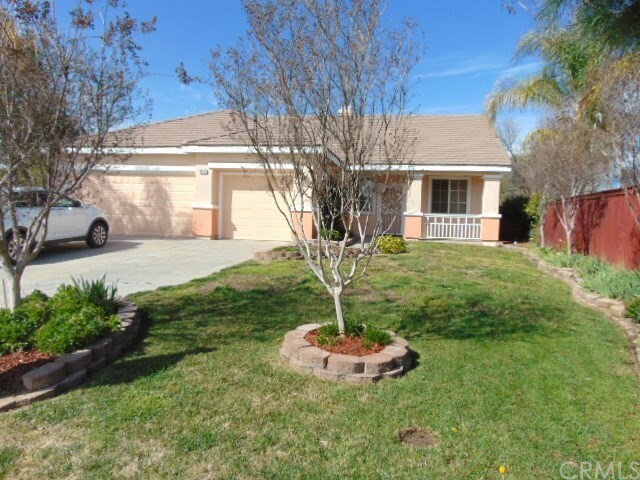 Beautiful home in a 55+ community with built-in handicap features in the home. Grand secured entrance welcomes you. The front yard coffee patio porch is perfect for a daily breath of fresh air. Interior features a formal dining room, living, sunroom, 4 bedrooms, 3 bathrooms with hardwood and tile throughout the home. Perfect for live in family or caregiving service. This home has one of the largest lots in the community! The beautiful yard has an existing garden area, fruit trees, 2 covered patios, and pool. Location is close to all shopping, freeways and medical needs. Don't miss this amazing home for senior living!" "This beautifully designed home in the Creekside 55+ Community features 3 Bedrooms 2 Baths plus a den. Living room with fireplace. Formal Dining room. Light and bright kitchen with lots of storage and breakfast nook with sliding glass door to covered patio. The master suite features a sliding glass door to a front patio. The master bathroom has dual sinks, skylight and large walk in cedar lined closet. The additional 2 bedrooms are on the opposite side of the home. The office is located near the front entry of the home could be used as a craft room or even an additional bedroom. The lot is over 8000 sq, feet. The backyard is fully landscaped with lush green grass, sprinklers, fruit trees and landscaped planter beds. Lots of room to entertain with the large covered patio. Room for all of your storage needs in the large double door shed with sky lights. All of this plus newer AC, FAU & Hot water heater. 2 car attached garage with lots of storage. Close to shopping, banking, restaurants, medical & fwy. Low tax rate! You will not be disappointed." "Wonderful home! Move in ready! 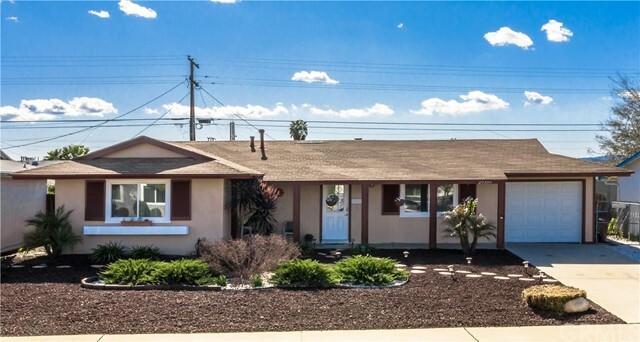 This 3 bedroom 2 bath single-story home is very spacious with over 1,700 livable square feet. 55+ community. Recent upgrades include new granite counter tops, tile flooring, and carpet in the bedrooms. Must see!" 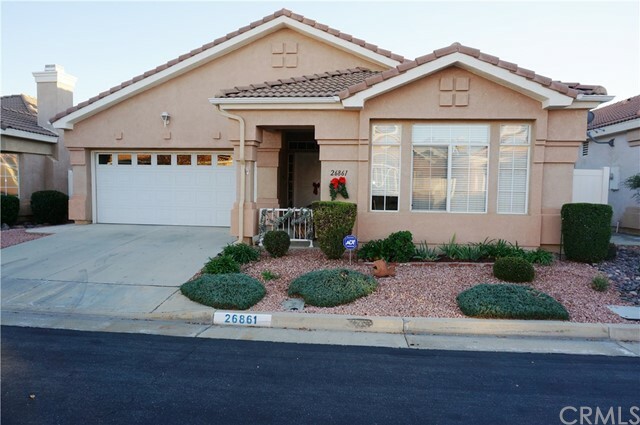 "Gorgeous home in the ACTIVE SENIOR 55+ community of Sun City. TURN-KEY - featuring 3 large bedrooms + Bonus Room + 2 full bathrooms. Almost 1800 sq' of living with a well laid out floorplan. The master bedroom has a private bath and 2 closets. Bedroom 2 has separate entrance into Hall Bathroom. An an enclosed patio/Bonus room is off the family room... perfect as an office or craft room. You will love the open floor plan! There is a formal living room, a separate formal dining area, and a spacious family room with beautiful brick fireplace. The kitchen has been remodeled and has newer cabinets, recessed lighting, a sky lgiht and tile flooring. Gorgeous engineered wood laminate throughout most of the home. This home has been lovingly maintained and was updated with fresh interior paint and dual paned windows. Newer roof and water heater, ceiling fans, faucet, garbage disposal. Drought resistant landscaping front and back, and the shed will stay. And OH, the AMENITIES of the Sun City Civic Association: Clubhouse, Banquet Rooms, Pools, Spa, Gym, Sport Courts, Library, Craft Classes, Lapidary Shop, Wood Working Shop, and SO MANY SOCIAL CLUBS!!! 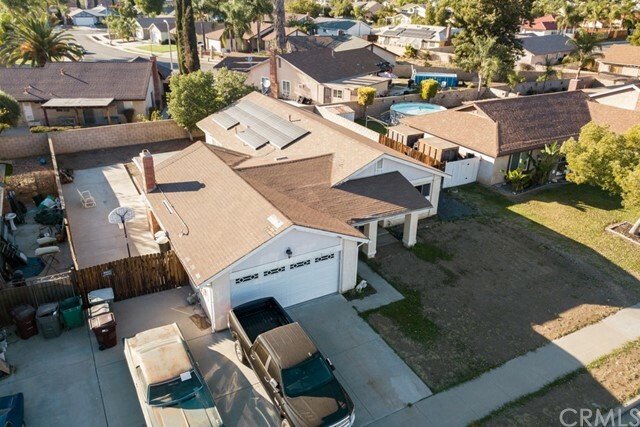 Close to shopping, restaurants, medical, and easy access to 215 freeway." "Adorable single story Pool home in 55+ Community of Sun City with No HOA! This home features a spacious floor plan with vaulted ceilings, custom built-ins, a cozy fireplace, and a beautiful pool and hot tub with a view. The home has a cozy living room with a fireplace, the family room is open to the kitchen, there is a small dining nook that overlooks the pool, and also a third office type room just off of the living room. The kitchen features white tile counter tops with white appliances and lots of cupboard and counter space. Tile flooring through out the house leads to the 3 bedrooms and 2 full bathrooms. The master bedroom has French doors that lead to the master bathroom which features dual sinks and a large walk-in closet. The home also has indoor laundry and lots of linen space in the hallway built-ins. There are two sliders which allow access to the backyard which features a full sized swimming pool and hot tub. The pool and hot tub are solar heated and the solar panels are owned outright (no lease). The backyard has lots of extra space on the side-yards, has a covered patio, and is very private. 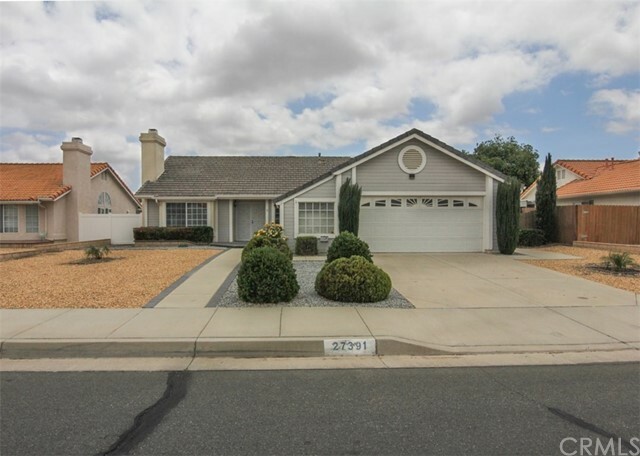 The community is close to shopping, restaurants, hospital, golf courses, and the freeway." "Full Remodel Ready to move in! The ONLY house For sale in the community with RV ACCESS!!! 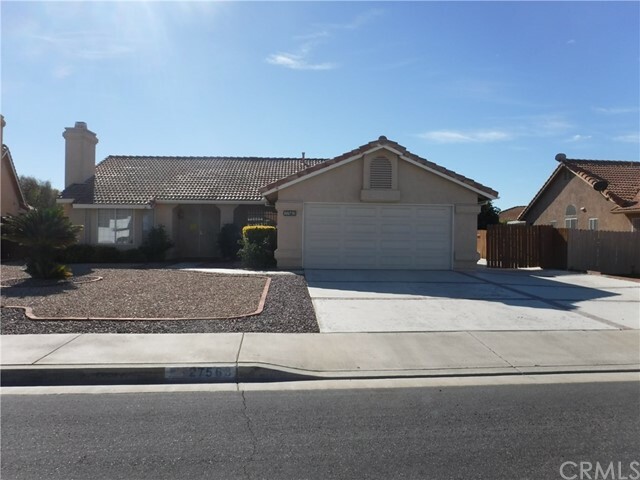 Are you looking for an affordable home in the Sun City with no repairs needed? Well here it is... This beautiful home offer a Great Open concept and it comes with 3 good size bedrooms and 2 Full Bathrooms* Master Bathroom comes with a walk in shower and safety handle bars* New Carpet in Bedrooms* New Vinyl plank flooring in living room, dining room, kitchen, bathrooms, Hall and laundry room* New Interior & Exterior painting* New Granite counter tops in kitchen* New re painted kitchen cabinets* New landscape front and back yard* Sun Room comes with new screens* New kitchen stainless sink and faucet* New bathroom vanities* New electrical outlets and switches* New light fixtures* New 3.5 base boards* New Front door* New reglazed tub and shower* One car garage* Come out and see how great this home really looks." "Located in The Club, a 55+ gated community this home has had only one owner and is located in an extremely quiet location in The Club, yet close enough to the Club House to walk if you choose. This home has been loved and it shows. This model is the largest in this community offering 2 over-sized bedrooms and a Den, a double sided fireplace , high ceilings, plenty of storage and room for everything and everyone. The tile flooring that is throughout the home, except for the bedrooms and den, is elegant and laid on the diagonal to create a feeling of even more space and accents the upgraded kitchen cupboards, granite counter tops and tile back-splash in the kitchen. The Den offers great built-ins that offer all of the work space and storage you would ever need along with a double - door entry. The Master Bedroom is over sized and is surrounded with windows to allow lots of light to stream in. There are double sinks in the Master Bathroom and a large walk in closet. The front bedroom overlooks this quiet street and also has a walk in closet and a large bank of windows for light. The backyard is landscaped with concrete and flowerbeds, all well kept and inviting. The Club offers a large Club House, heated swimming pool, spa, on site management, a banquet room with stage and professional kitchen, an exercise room with TV, billiards room , library, and more. If you have an RV, there is gated RV parking for a very, very low amount each month. Vinyl Fence." "***PRICE REDUCED!! 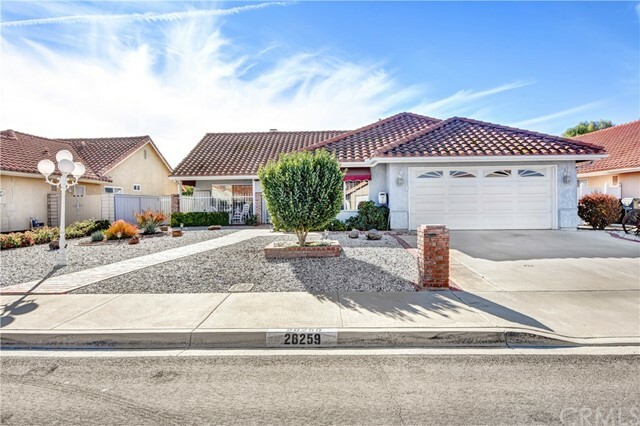 LARGE SINGLE-STORY HOME WITH HUGE RV PARKING PAD (Parks 4 Vehicles) NESTLED IN THE HEART OF MENIFEE/SUN CITY!! ***LOW 1.18% PROPERTY TAX - NO HOA!! ***SHORT SALE***This Floor Plan is Perfectly Laid Out with Everything You Need in an Ample 1,873 s.f. of Living Space! Enter in upon a Sizable Living Room found adjacent to a Separate Formal Dining Room. Next, slide into the Modern Updated Kitchen (Remodeled in 2007) with Beautiful Cherry Wood Cabinetry Inclusive of Some Frosted Display Glass Doors - Pantry - Granite Counters - Stainless Sink & Faucet - Crown Molding and a Cleverly-Crafted Wood Ceiling Inset! Let's Not Leave out the Over-Sized Bonus Eating Area Next to the Kitchen that leads into a Big Family Room with Cathedral Ceilings, a Brick-Faced Fireplace and a Glass Slider to the Back Patio! Moving Down the Hallway You Will Find Two Bedrooms, One Full Bath and an Enclosed Closet Laundry Area. The Master Suite is Well-Located at the Back of the Home and is Unique in that it has an Attached Master Retreat with Dual Full-Sized His/Hers Closets, a Glass Slider to the Back Yard and Master Bath with a Walk-In Shower! Other Notable Features Include: a 7,841 s.f. Lot, 2-Car Attached Garage with Auto Roll-Up Door, Large Covered Front Porch, Fully Fenced Back Yard (Nearly all Block Wall), Automatic Sprinklers, Big Covered Wood Back Patio and Solar Lease with Solar City! This Property has some Deferred Maintenance & Needed Repairs which are REFLECTED IN THE PRICE." "Ready to move in home!! !Gorgeous spacious home located in one of the most prestigious quiet areas in Sun City with little traffic in 55+ community. Walk in trough double doors entry into the living room and formal dining area. Entire home recently painted and has upgraded laminated floor. Kitchen offers open layout with space for dining table and a family area with lovely fireplace with stone facade. All bedrooms are spacious. Huge nicely landscaped backyard perfect for entertaining family and guests or just to relax and enjoy the beautiful weather. Low maintenance front and backyards. The HOA community is very active with ongoing events and trips for your enjoyment. Two swimming pools, lawn bowling, billiards and a card room are next to the Club House of an 18 hole golf course! It is less than 3 miles to the Newport Mall. LOW TAX RATE AND VERY LOW HOA." "Welcome home to this great 3 bedroom home in 'The Core'. Presley # 39 model with over 2000 sq. feet. 3 large bedrooms, 2 baths. Large living room and formal dining room. Laminate flooring in kitchen and family room. Raised flooring in lanai is included in the square footage. Large wood burning rock fireplace and a large backyard. Low maintenance rock landscaping in front & backyard! Close to all amenities. Super low HOA's and taxes! This one is a must see!" "This single-story home is in the age-restricted 55+, highly desirable community of Seranade. Features include a great flowing floor plan with formal living and dining room, open spacious kitchen, 3 bedrooms and 2 bathrooms. Outside you'll find immaculate, low maintenance landscaping, large back yard and side yard with possible RV parking! Close to shopping and freeway." 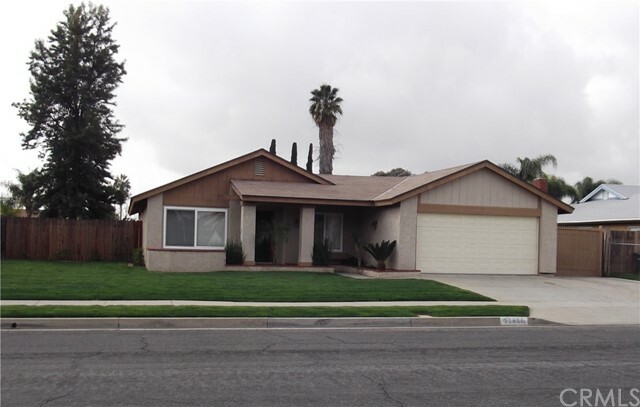 "Well maintained 1941 sqft 3 Bed 2.5 Bath home in a 55+ Community. This home has been upgraded with a BRAND NEW Solar System Being PAID IN FULL BY SELLER FOR NEW BUYER, Upgraded electric panel and Tankless water heater. Take advantage of the low utility cost for years to come! Nice large open kitchen with lots of cabinet space. Good size bedrooms with a large master. HOA includes Banquet facilities, sports courts, a Fitness center and a recreation room. If you are looking for a home with a little more space in this wonderful 55+ community! Then look no further!" 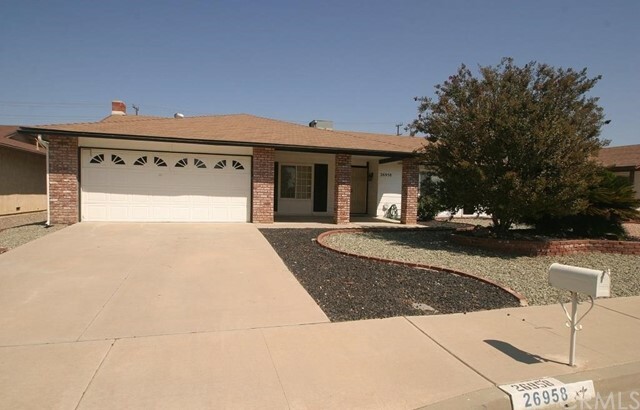 "Nicely updated North Sun City 55+ Home. Upgrades include hard wood flooring, travertine tile counter tops, plantation shutters, designer carpet in some rooms, and a fully enclosed patio room adding to the original square footage. Low maintenance front and rear yards with tremendous curb appeal." "HUGE PRICE REDUCTION!!! Location, Privacy and a quiet neighborhood AND 2 Bedrooms/ 3.5 Bathrooms with a Giant Family Room. This home is clean as a whistle with a peaceful, low maintenance front and back yard that backs to the hills and nature. Convenient SINGLE STORY, in fantastic 55+ community of Sun City. Upgraded home with 2 Bedrooms and 3.5 Bathrooms and a finished garage. The garage space was converted back from a finished bedroom to a garage. A well done addition was put on this home giving it a formal living room, a separate dining room and a large family room. The flooring is upgraded with wood in the formal living room and entry, tile throughout the kitchen, dining room, family room and bathrooms and carpet in the bedrooms . The kitchen has an eat in area and a counter breakfast bar. The window over the sink allows natural light to fill this space. The laundry room is over sized, giving you extra room for storage. Front porch is wonderful for visiting with neighbors and the relaxing patio with a view of the hills will become your favorite spot for morning coffee. Ceiling fans throughout. Excellent condition. 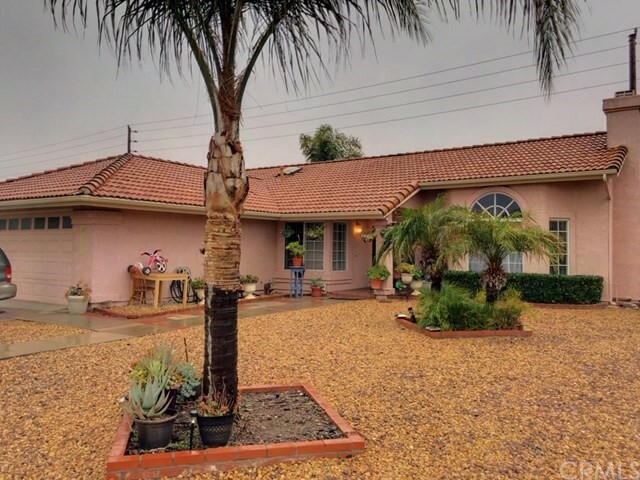 Wonderful Location close to 215 freeway and shopping areas. Association amenities include common facilities such as the pools, spa, sports courts , club rooms all with a low HOA fees. This is a must see home." "Beautifully maintained, turnkey 2 bed, 1 den/office, 2 bath 1328 sq. 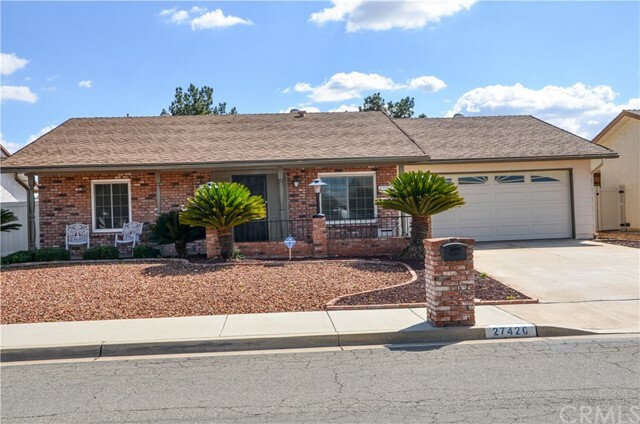 ft. single story home in the Sun City 55+ area of Menifee. Open, spacious layout coupled with light color tones and tons of natural light really make this home feel larger than it is!! Carpet-free, allergy-resistant tile and engineered Hickory wood flooring throughout, thick baseboards, and newer paint in the interior! (Recent entire exterior paint also.) Kitchen boasts a U-shape layout with plenty of storage space, recessed lighting and a slider leading to one (covered) of two patios and the side yard. Each bedroom has a large footprint with ceiling fans and lighting. High-quality ceiling fans/lighting in lanai and living room also. Front bedroom has custom built in cabinets and French doors. Master: Slider with access to Zen-like backyard, large walk-in closet and a vanity. The second bathroom offers a floating vanity, Toto toilet and walk-in shower; Master bath offers similar but a shower/tub combo. Appliances in great shape with new AC unit installed 2015, water heater 2017. 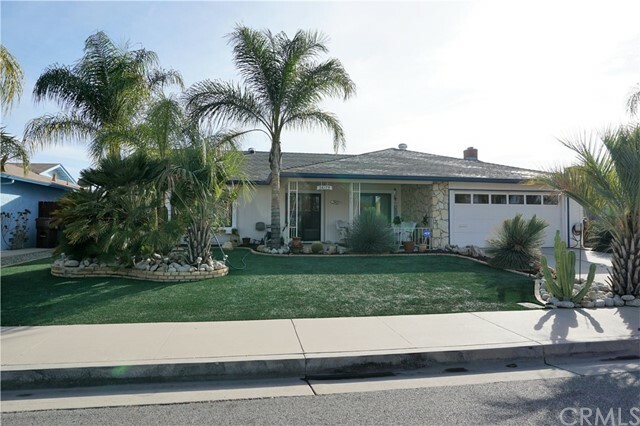 Front and back yards: drought tolerant, low maintenance landscaping complete with sprinkler system on about 95% of the plants. Enjoy evenings under patio cover eating lush citrus from one of your mature evergreen lemon, tangerine or plumelo trees; pomegranate and fig trees are newly planted. Attached two-car garage with some overhead storage. Washer, dryer and refrigerator are included at the right price!" 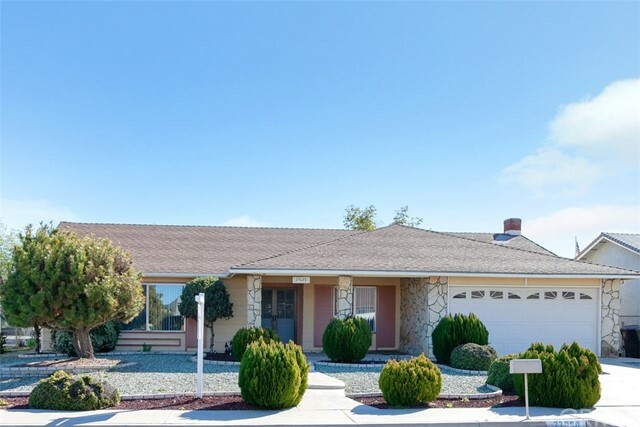 "It is ready to move into as soon as escrow closes. New laminate (hard wood) floors plus new carpet and paint. Large eat in kitchen. The kitchen has an updated look with ceiling pocket lighting, all white throughout. All appliances stay. Separate laundry room. Also separate store room. It makes a huge pantry for storing an ample supply of food and kitchen items. Living room with fireplace, has room for comfortable seating. Dinning room right off kitchen makes for ease of serving. 2 bedrooms with bathrooms attached. Ample closet space in each bedroom, Master has a walk in closet. Covered porch off living room gives a lovely outdoor seating space. The fenced in yard features a zen like mediation area. The side yard has a separate pergola, would be a quiet area away from any noise inside the home. 2 car garage with storage. Senior area offers swimming pools gym organized hobby rooms and other recreation adventures. Included in the home is a room used for an office." "JUST BEAUFIFUL!!! 2BR 2BA HOME IN SUN CITY 55+ COMMUNITY! Come and see this great home tastefully updated with many neutral colored installations throughout. Some of the upgrades include NEW Paint inside and out, NEW Carpeting, NEW Tile Flooring, NEW Electrical outlets, Hand Textured ceilings and NEW Canned Lighting. 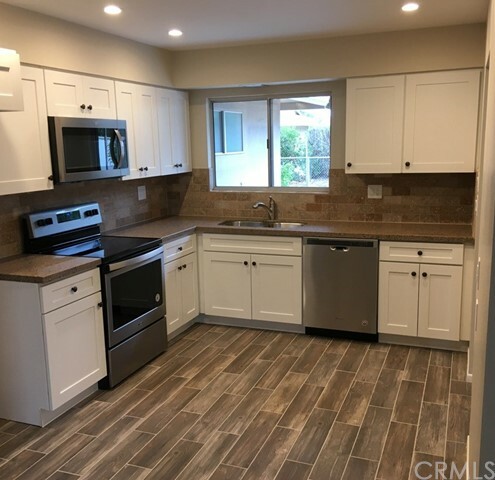 Check out the gorgeous kitchen with NEW Quartz Counter Tops NEW Tile Backsplash, NEW WHIRLPOOL Stainless Steel Microwave, Dishwasher, and Range. NEW Bathroom VanitIies, NEW Toilets, NEW Sinks, and NEW Light Switches and fixtures. Upgraded Dual Paned Windows, newer HVAC system, storage shed, covered backyard patio, low maintenance landscaping too. Very Nice home, easy to show, Seller can do a quick escrow. Check out the HOA website for many amenities and activities offered." "This home is a must see! 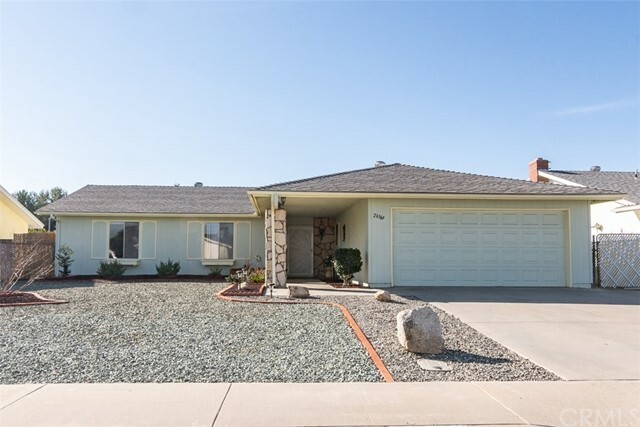 Beautifully remodeled 55+ plus community home located on a quiet street. 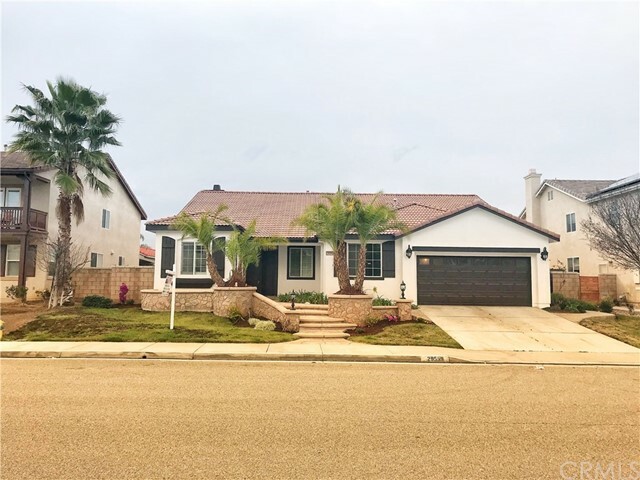 Enjoy the ease of a water-wise front yard and the beauty of a landscaped oversized large back yard that include a covered patio, easy maintenance lawn turf, and a garden setting complete with an arbor for sitting and enjoying the flower beds. This very clean two bedroom and two bath home with garage has been custom painted inside and out. Upon entering you will love the light and bright interior that leads to a large open floor plan great for relaxing and entertaining. The home has been remodeled cosmetically and major home systems have been updated. The AC and heater are only one year new and have extended warranty on them. The home is fitted with new dual pane energy efficient windows & engineered wood flooring throughout and sewer line from the home to the street has been replaces last year. The kitchen has been remodeled with granite counters ,backsplash, NEW Stainless Steel appliances, High end stove, oven and fan system over the kitchen Island. Both bathrooms have been updated with tile floors, the tile shower surrounds, cabinets and granite counters. Just off the great room area is the bonus room that can be used as a den/dining room or office. Home includes new ceiling fans, individual laundry area in the garage with a new dryer exhaust system. The garage has parking for one car and has lots of storage space. Low HOA and Taxes. located in the SUN City Civic Association."